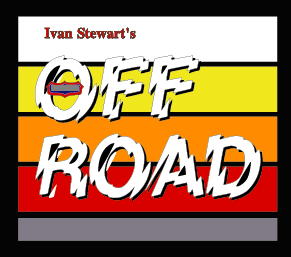 Super Off Road, also known as Ivan 'Ironman' Stewart's Super Off Road, is an arcade video game released in 1989 by Leland Corporation. Virgin Games produced several home versions in 1990. In 1991, an NES version was later released by Leland's Tradewest subsidiary followed by versions for most major home formats, including Super NES, Amiga and MS-DOS. A sequel was created called Super Off Road: The Baja. 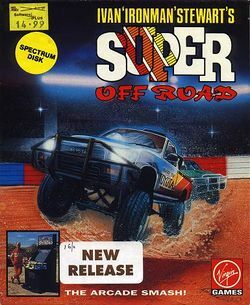 It was released for Super Nintendo and is based on the Baja 1000 race. The format was changed to a 3rd person camera instead of an overhead camera. The game Excite Truck for the Wii very much resembles the game. In the game, up to 3 players (4 in the NES version through use of either the NES Satellite or NES Four Score) compete against each other or the computer in racing around several top-view indoor off-road truck tracks of increasing difficulty. Good results earn the player points to continue in the championship and money with which to upgrade their truck or buy more nitro boosters. The goal is to reach the end of the season with the most money earned. Continues are available, but whereas players can get extra money in the arcade version, in the home versions, the player's money is reset to 0. This is one of the first games where the player could upgrade his or her vehicle by earning points or money (although in Atari Games' Sprint series, one could upgrade their racer using wrenches), a system that is used in most arcade-style racing games today. This page was last edited on 29 April 2009, at 18:05.